We’re living in dark times, my friends, dark times. What do I turn to to make things a little more bearable? Gin, for one. And a giant punch bowl of spaghetti. And maybe 400 horsepower in the form of the 2020 Volkswagen Golf R, if this rumor is true. Accompanying the eighth-generation Volkswagen Golf in about a year will be a fired-up R version, reports Auto Express. It could have 400 HP from the 2.0-liter four-cylinder motor, all-wheel drive and VW’s dual-clutch gearbox. “The R brand is going extreme. The role of R is that it can go beyond the rational; nobody needs a compact car with 400bhp, but is there a place [for it?]. 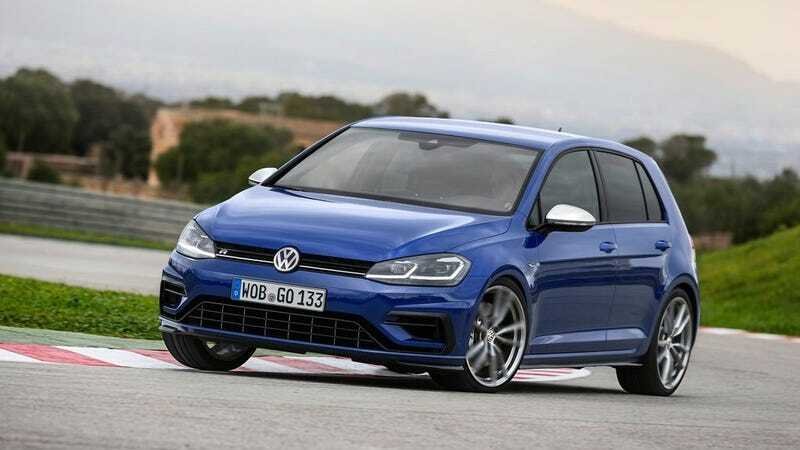 Certainly, and that’s the turf of R.
Four hundred horses would be a significant jump up from the current Golf R’s output, which comes to 292 horsepower. A turned-up Golf R would put it competitively with the Honda Civic Type R, the Ford Focus RS and the Mercedes-AMG CLA 45. I try not to ask for many things in life, but I do ask for this.